BOS Nyaru Menteng Releases 12 More Orangutans! There are several hundred more orangutans to go! We can't do it without you! 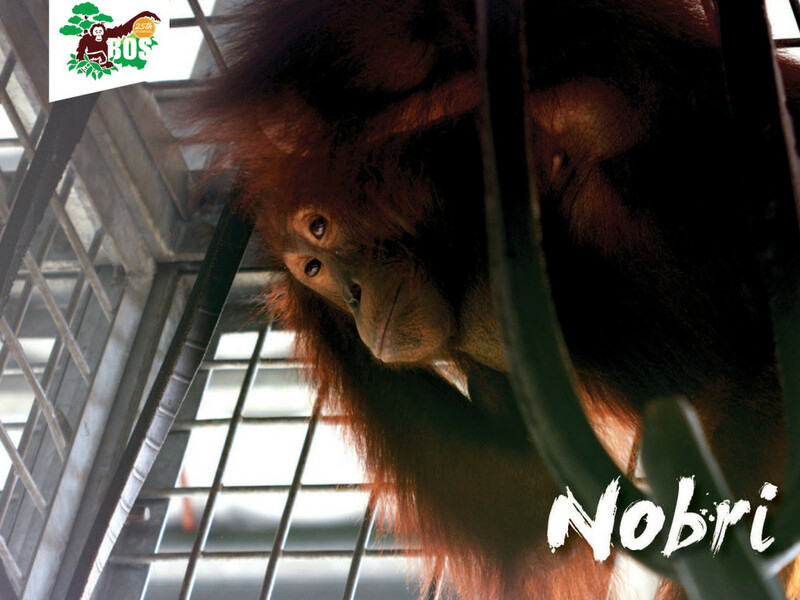 Please support the BOS Nyaru Menteng Orangutan Release Program by making a donation today! Learn more about the Release Program here. Semi-wild orangutans are those who – at the time of rescue – have previously encountered humans yet have retained sufficient natural behaviours and vital skills to survive alone in the wild. Sofi came to Nyaru Menteng from a palm-oil concession area in East Kotawaringin Regency, Central Kalimantan, on 15 November 2006. She was rescued by teams from the Central Kalimantan BKSDA and BOSF Nyaru Menteng. At the time of rescue, Sofi was 4.5 years old and weighed only 8 kilograms. She was found in poor condition with severe burns to both wrists and ankles. Her arms were swollen and she had limited use of them. Even so, Sofi maintained her independent stance and did not show dependency on, or need for, human assistance. Regardless, her poor condition meant she needed to stay a while in quarantine so her wounds could heal. Sofi is now 14 years old and weighs 56 kilograms, with beautiful reddish-brown hair. After spending nine years at the rehabilitation centre, Sofi will soon embark on a new adventure – being released to the natural, wild habitat of the Bukit Batikap Conservation Forest. Belli is a female orangutan rescued from a palm-oil plantation worker from East Kotawaringin Regency, in Central Kalimantan, on 21 March 2006. 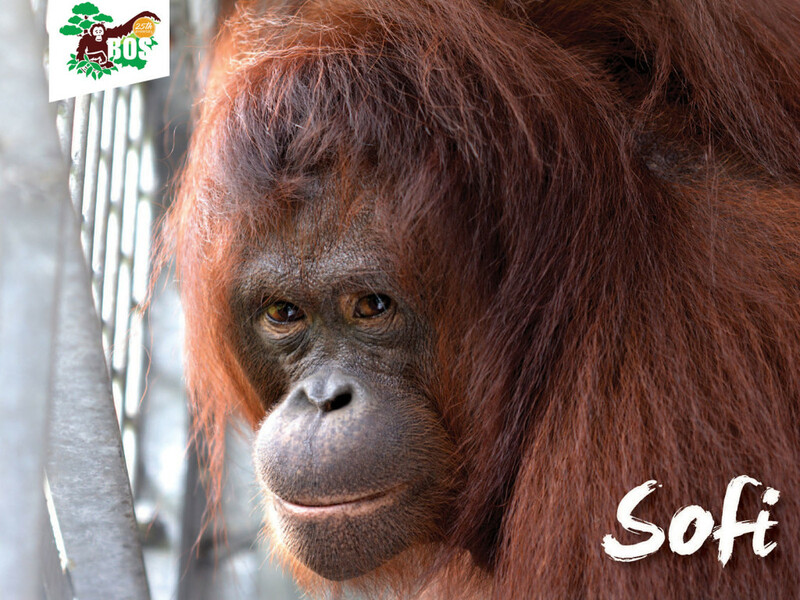 When she arrived at Nyaru Menteng, wild-natured Belli was 4 years old and weighed just 7.5 kilograms. In 2009, during her rehabilitation time at the Forest School, Belli ran away from the Nyaru Menteng centre with some of her friends. When we eventually found her, we discovered her right eye was infected and the Nyaru Menteng medical team had to perform surgery in an attempt to prevent the infection from spreading. Alas, there was not much they could do to save the sight in Belli’s right eye, and she is now blind on that side. However, this beautiful female with thin, blackish-brown long hair has still been able to acquire an amazing set of skills. 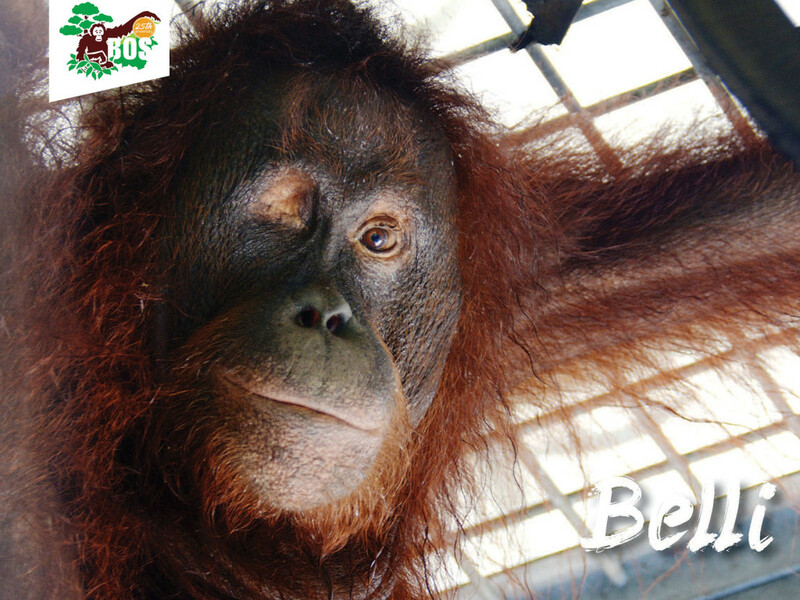 After graduating from the Forest School on 19 September 2014, Belli was transferred to Kaja pre-release island and has since adapted well there. Belli is gentle and friendly toward others and is highly skilled at foraging for natural food. At her current age of 15 years, and weighing in at 40.3 kilograms, Belli is more than ready to taste freedom at the Bukit Batikap Conservation Forest. Nobri was born on Kaja pre-release island, on 29 August 2005. She is the first daughter of Shelli, who was released in November 2013 to Bukit Batikap Conservation Forest together with her second daughter, Forest. Shelli lovingly took care of Nobri and taught her sound survival skills. Little wonder Nobri has grown into an independent and confident individual who loves to roam the island! Nobri is very good at building nests and foraging for natural food. She has a thick, muscular body, which makes her stand out from others. Nobri dislikes human presence and will usually kiss-squeak to show her displeasure. Now at 11 years of age and weighing 30 kilograms, this shorthaired beauty with bright eyes will return to the natural habitat of the Bukit Batikap Conservation Forest to reunite with her mother Shelli and her younger sister, Forest. Rehabilitant orangutans are those individuals rescued at a young age and/or confiscated from people who have kept them in captivity. These orangutans have limited knowledge and skills to live independently in the forest, and therefore need to undergo a period of rehabilitation. Lomon is a male orangutan confiscated by Central Kalimantan BKSDA from a local resident of Sampit, Central Kalimantan on 10 April 2006. According to information, Lomon was found raiding a pineapple field and during captive, he was chained and placed inside a wooden box without sufficient space. Lomon arived in Nyaru Menteng in a severe malnourished condition, anemia, and hypoproteinemia which estimated due to years of malnutrition. Lomon then grew into a very healthy and independent male. He was one of orangutans in the series of Orangutan Diary, a BBC production. Many of you may remember him from our adoption program. ALong with Kesi, Fio and Grendon, Lomon was one of our original adoptees back in 2007. 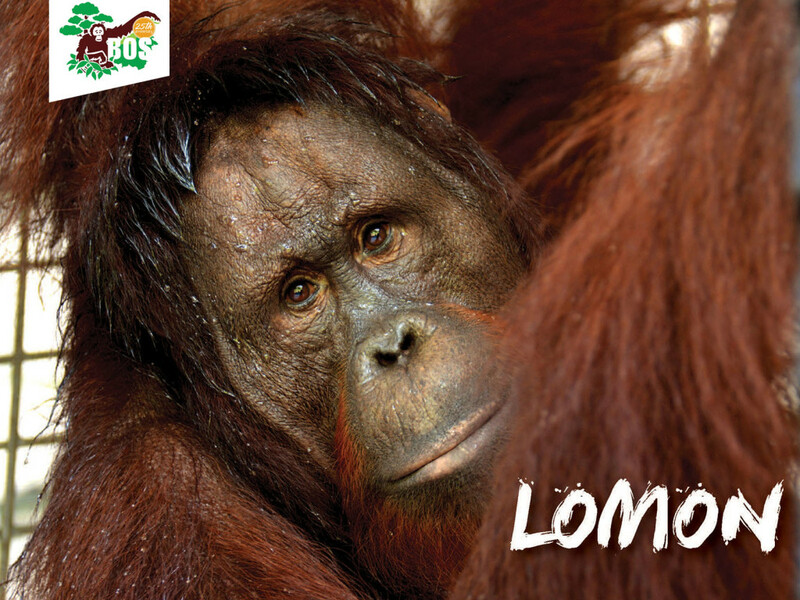 After graduating from Forest School, Lomon, who has wistful gaze and dark face with rather light lips, went to live in Bangamat pre-release island. He became one of the greatest explorers in the island, and also a leader. He leads his friends during feeding time, and he would dominate the platform making sure he was the one selecting foods. Lomon is also very good at breaking up coconuts. He can do one coconut in 30 seconds! Now Lomon has reached 14 years old and 51.4 kg in weight. Looking back to the day he arrived in Nyaru Menteng, Lomon was very skinny and without confident. Now, he is extremely self-reliant, dominant, and respected by his peers. During his 10 years of rehabilitation, Lomon has learned enough survival skills and he is now ready to prove his ability to live as a true wild orangutan in Bukit Batikap Conservation Forest. Suta is a female orangutan who was confiscated from a palm-oil plantation worker from Pundu village, in East Kotawaringin Regency of Central Kalimantan, on 6 February 2007. She was 3-years-old at the time of rescue and weighed only 8 kilograms. 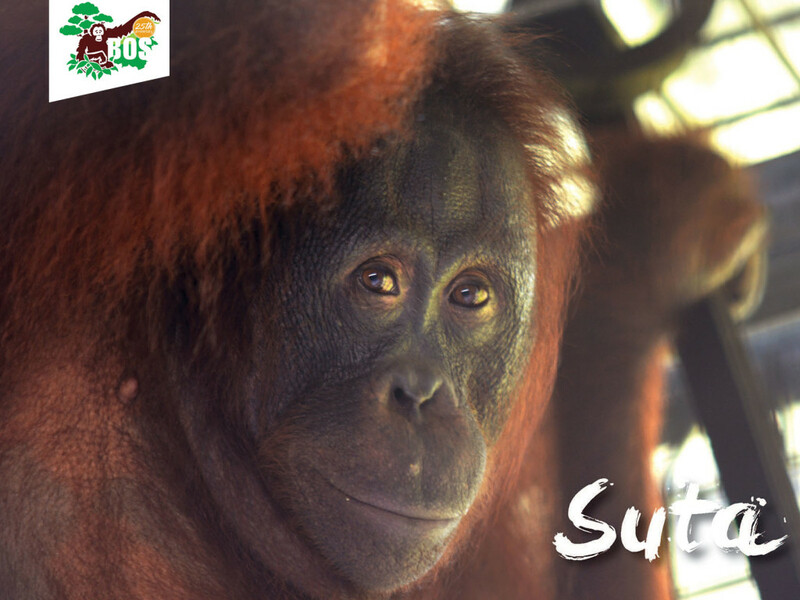 After graduating from the Forest School in 2012, thick-haired Suta was transferred to Bangamat pre-release island in Nyaru Menteng. However, a long drought in 2013 saw the Rungan River dry out and Suta managed to cross over to neighbouring Kaja Island. On Kaja, Suta grew to become a curious explorer with good foraging and nest-building skills. Beautiful Suta is easy to identify, with her big round eyes and unique bump on her forehead. After spending almost nine years at our rehabilitation centre and now weighing 38 kilograms, it is now time for Suta to enjoy her freedom in the Bukit Batikap Conservation Forest of Central Kalimantan. Olbert was confiscated from a palm-oil plantation worker from Pundu village, in East Kotawaringin Regency of Central Kalimantan, on 24 February 2007. When he arrived at Nyaru Menteng, Olbert was 3 years old and weighed just 6 kilograms. After passing a quarantine period, Olbert joined the Forest School to undergo rehabilitation, so he could learn to become an independent orangutan. After finishing Forest School, Olbert went to the Bangamat pre-release island on 20 December 2012. This dark-brown, longhaired male is quite friendly to others and has become very good at building nests and foraging for natural food. 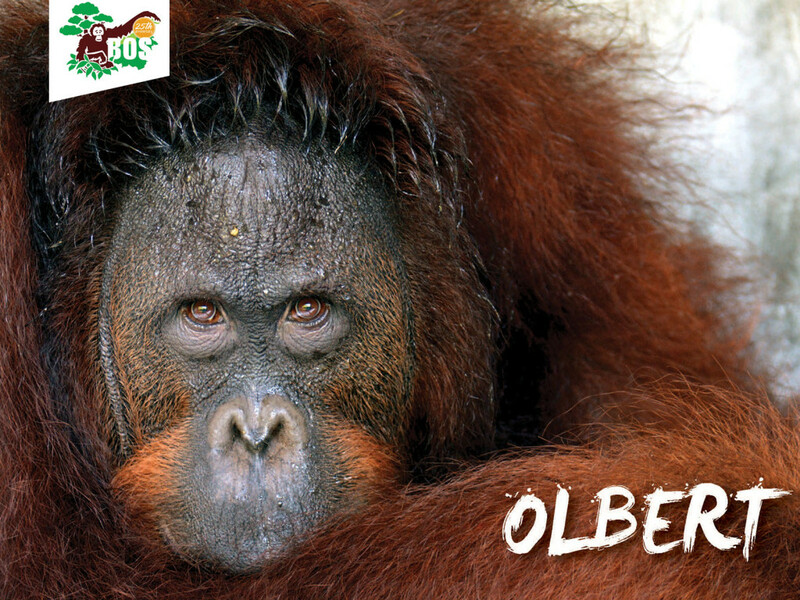 Olbert is distinctively handsome, with his flat forehead, orang beard and growing cheek pads. Olbert is now 12 years old, and with his acquired skillset is more than ready to explore his new home in the Bukit Batikap Conservation Forest. 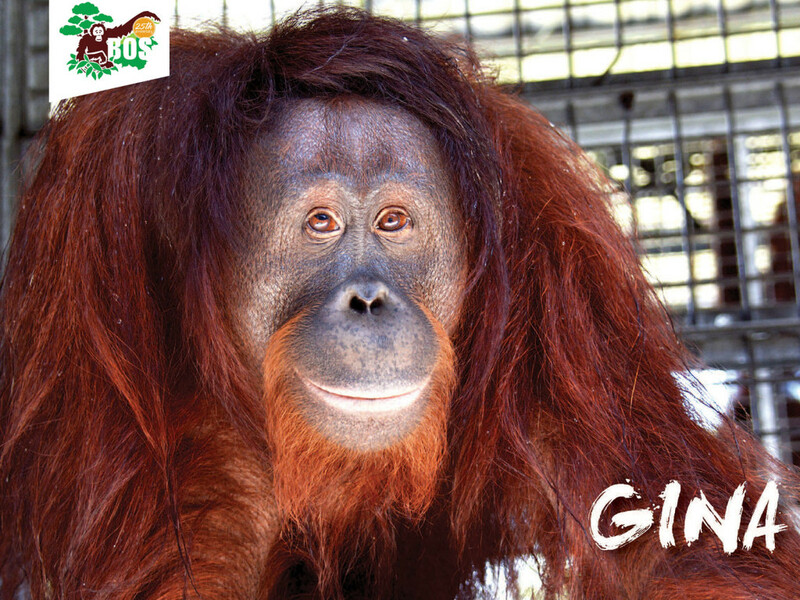 Gina arrived at Nyaru Menteng on 3 November 2001, after being confiscated by the Central Kalimantan BKSDA from a local resident from Pujon village, in Kapuas Regency, Central Kalimantan. She was just one year old and weighed four kilograms, with a severe wound to her left pinkie finger. With intensive care from our medical team, her finger thankfully healed. Like other orangutans who enter rehabilitation and then graduate from the Forest School, Gina progressed to the pre-release island stage and was moved to Bangamat. In 2012, our medical team discovered that Gina’s right eye was afflicted with a cataract. However, this seems to have not affected her daily activities and Gina is still able to roam through the trees, build nests and forage for natural food. This bulky orangutan with dark-brown, long hair is now 16 years old and weighs 59.2 kilograms. With all the skills she has acquired, Gina is more than prepared to return to her natural habitat in the Bukit Batikap Conservation Forest. Zakia arrived at Nyaru Menteng on 28 June 2003, after being confiscated by the BKSDA from a local resident from Parenggean village, in East Kotawaringin Regency, Central Kalimantan, who had held her captive in a wooden box. When she arrived at Nyaru Menteng she was eight months old and weighed only 1.7 kilograms. She was suffering severe dehydration and required immediate treatment from our medical team. 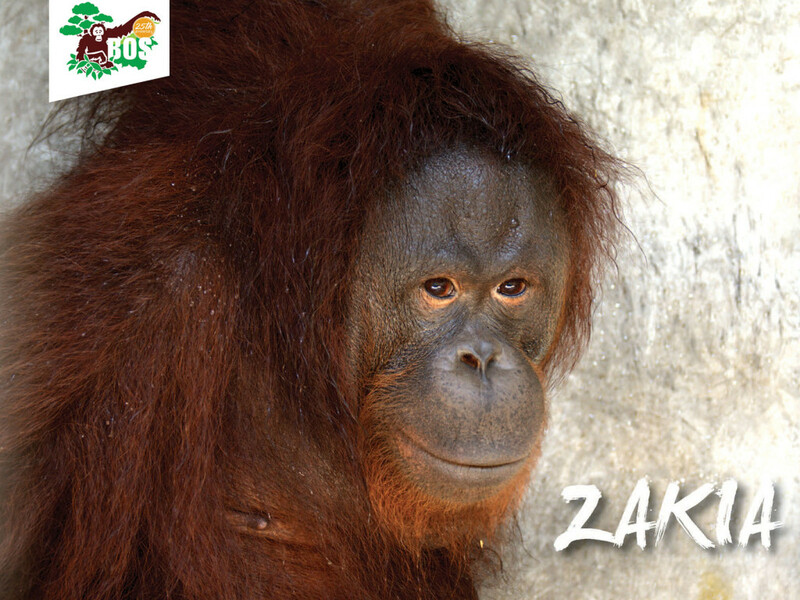 Upon graduating from the Forest School, Zakia continued her training on Bangamat pre-release island. There, this dark-brown, thick-haired beauty who loves to play with water honed her exploring and foraging skills. Bulky Zakia is now 14 years old and weighs 50 kilograms. After 13 years of rehabilitation, her survival skills are no longer in question and soon Zakia will be exploring the beauty of the Bukit Batikap Conservation Forest. 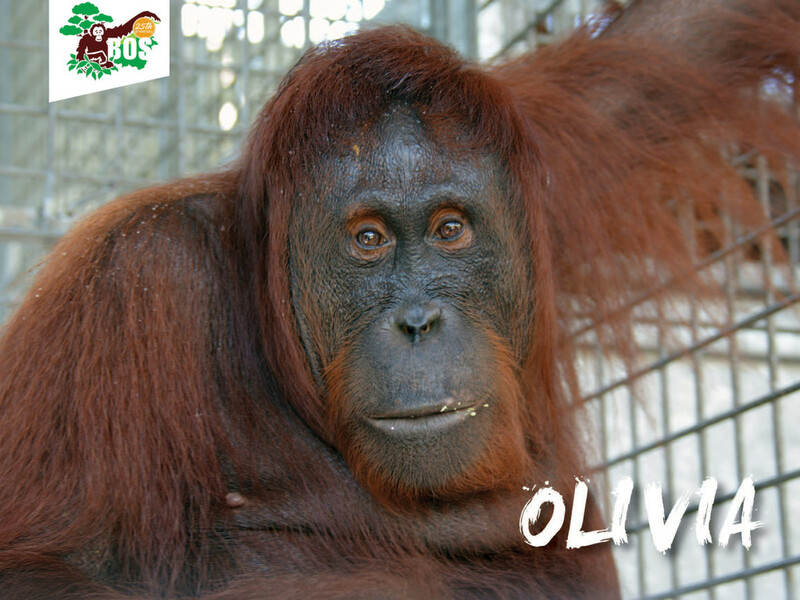 Olivia, or Olive, as she is more commonly known, was confiscated from Ketapang village, West Kalimantan, on 28 March 2003. When she arrived at Nyaru Menteng she was two years old and weighed only nine kilograms. After finishing Forest School, Olive moved to Kaja pre-release island in 2013. The long-and-thin, reddish-brown-haired Olive is a dominant figure and shows aggression toward humans. She is easily recognisable with her black face and reddish eyelids. Olive has now reached 15 years of age and weighs 54.3 kilograms. The skills she has acquired during her 13 years of rehabilitation at Nyaru Menteng have prepared her for life in the wilds of the Bukit Batikap Conservation Forest. Sule, who was two years old and weighed 7.5 kilograms when she came to Nyaru Menteng on 26 November 2010, was confiscated from a local resident from Luwuk Bunter village, in Cempaga Sub-Regency, East Kotawaringin Regency. After four years in the Forest School, Sule was moved to Kaja pre-release island on 20 September 2014. This long-dark-brown-haired female is not an aggressive individual, yet is highly alert and prefers to roam alone. Sule dislikes human presence and is one of the better explorers on Kaja pre-release island. Attractive Sule is now nine years old and weighs 35.8 kilograms. 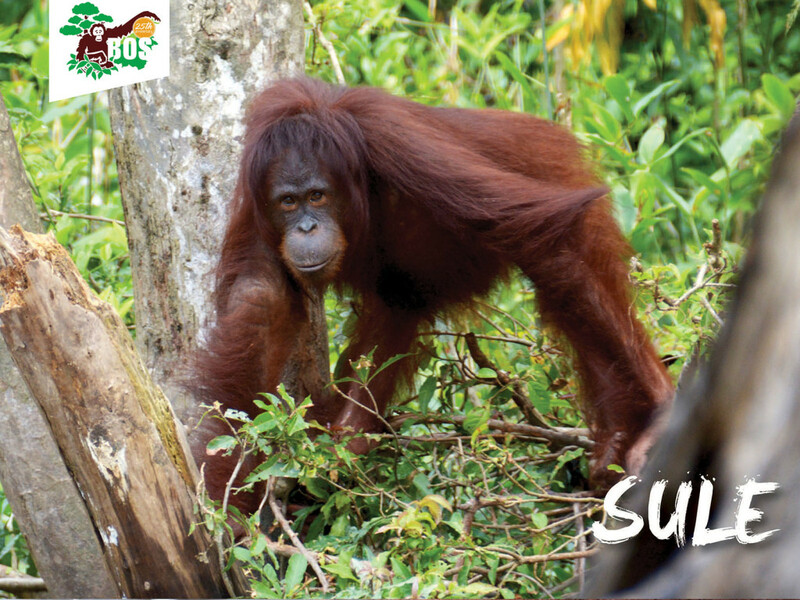 After six years of rehabilitation, Sule has grown into an amazing figure and is more than ready to begin a new life in the Bukit Batikap Conservation Forest. Kevin was confiscated from a local resident from Sampit city, in Central Kalimantan, through a joint-rescue effort between the Central Kalimantan BKSDA and the BOS Foundation team from Nyaru Menteng. When he arrived at Nyaru Menteng, Kevin was two years old and weighed 7.4 kilograms. 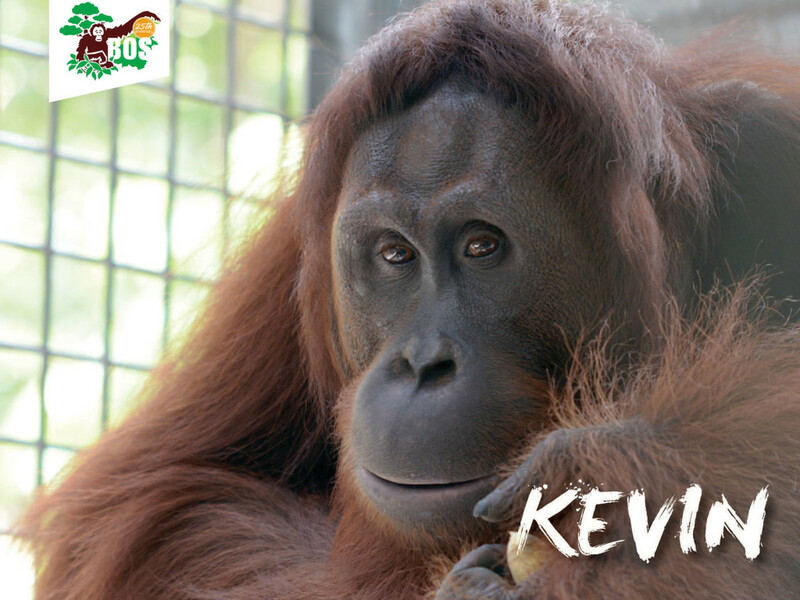 After finishing Forest School in 2012, Kevin went to the Bangamat pre-release island. Kevin is known for being an aggressive and dominant male, and he dislikes human presence. With his long-blackish-brown hair and bulging temple, Kevin is an exceptional explorer and is very good at foraging. He is growing dark cheek pads, which is enhancing his already outstanding appearance. Kevin acquired many skills whilst at Nyaru Menteng for 13 years of rehabilitation. Now at 16 years of age and weighing in at 47.5 kilograms, handsome Kevin is ready to enjoy his new life as a wild orangutan in the Bukit Batikap Conservation Forest. Ella was confiscated from a local resident from Pilang village, in Pulang Pisau Regency, Central Kalimantan. She arrived at Nyaru Menteng on 28 July 2005, when she was just two years old and weighed 11 kilograms. 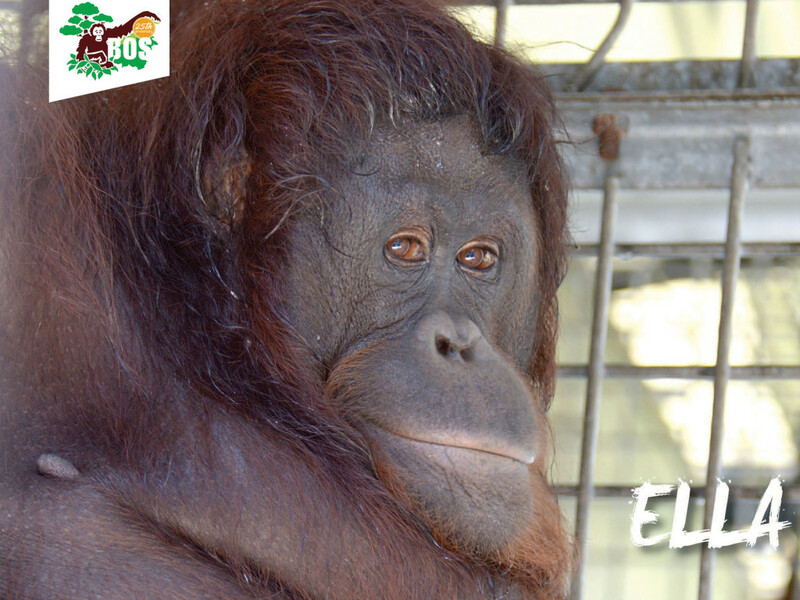 On 29 June 2013, the thick-blackish-brown-haired Ella was moved to Kaja pre-release island. Ella, who is somewhat of a loner, is a good explorer and forager. She is very alert and quickly climbs high up into the trees the very second she senses danger. The beautiful and shorthaired Ella is now 14 years old and weighs 62.1 kilograms. This bulky, yet agile orangutan is ready to prove her ability to survive in the wilds of the Bukit Batikap Conservation Forest.